Dual fuel ranges have increased in popularity as the interest in professional model home kitchens has risen. Installing a dual fuel range can provide a cook with the advantages of more than one type of fuel as opposed to the limitations of a single fuel range. A dual fuel range is a range that is powered by more than one type of fuel. 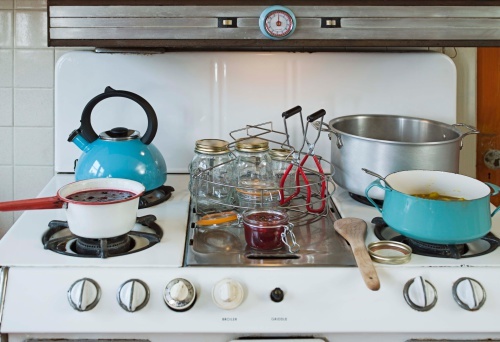 According to the Good Housekeeping website, an example of a dual fuel range is one where the cook top burners are fueled by gas and the oven is fueled by electricity. The most common type seen in the United States is the gas and electric combination. The gas used can be either natural gas or propane. Gas cook top burners heat faster than electric and allow better temperature control than electric burners. Electric ovens are thought to heat more evenly, which is important in baking. They are also more efficient when using the self-cleaning feature. Using a dual fuel range for cooking may be ideal, but consideration needs to be give to the expense of installation. Both a gas line and a 240V outlet are required. Think about your style of cooking when considering a dual fuel range. If most of the cooking to be done is stove top and little baking is done, an all-gas range may be a more economical and better choice. If most of the cooking to be done is simmering and baking, an all electric range may be the best choice. How Much Propane Does a Range Use?